First, our construction and equipment customers are King (and Queen, so we don’t miss anyone). When Gamka gets an inquiry we do our best to come through with answers that will solve the problem. Some people have a catalog and let it be the solution. Not at Gamka! While we have lots of information ready to dispense, we want to save our customers the time and trouble of figuring out what they want. So we listen, ask questions and apply application engieering to come up with the best way to help. Sometimes there are several ways and sometimes not, whatever, we will give you our considered opinion to assist. Second, Gamka has its own fleet of trucks and drivers to match. When you need a delivery we will get it to you the day you call or the following business day, as long as we have it you will get it. And QUICK! 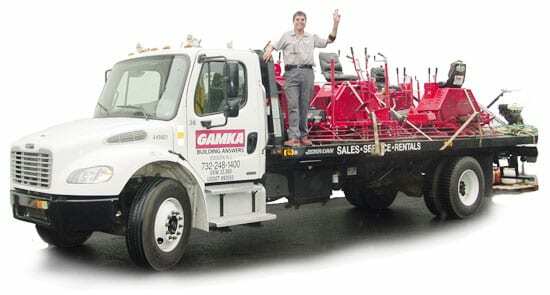 Gamka’s Truck fleet regularly delivers to the New Jersey Counties of Bergen, Burlington, Camden, Essex, Hudson, Hunterdon, Mercer, Middlesex, Monmouth, Morris, Ocean, Passaic, Somerset, Sussex, Union, Warren –plus, in New York, Orange, Rockland and Staten Island (Richmond County). However, these are the ones we go to daily as needed. We will make a special delivery to our customers working in New Jersey but further south, in New York City, Long Island and nearby Connecticut and Pennsylvania. Call us for your delivery today.